The foundation of how businesses need to operate has changed drastically over the past 10, 15, even 20 years. The internet changed many things-and how people want to engage with businesses has changed too. To effectively build and lead an entity that serves you, your clients and the community, it’s not enough to simply just be ‘good’ at something. Today’s consumers demand more. All too often, people jump into starting a business without a plan. They have never set up a business before. They may be good at what they do, but that is not enough information to turn a skill set into leading and running a thriving business for the long haul. Over the years Debbra Sweet and her companies have helped many businesses turn from being ‘upside down’ business into ones where the foundation is solid and will expand easily when needed. She has helped start ups avoid common pitfalls that close doors before they ever have a chance to ‘make it’. She helps transition larger businesses and organizations that were stagnant or imploding due to disconnect and operating with a ‘pod’ or ‘silo’ mindset- to become refocused, united in purpose and break through barriers to reach a new level of success. Some things are timeless to the success of every business. Other things require ongoing learning and training in order to stay competitive and thrive. Below are three key presentations Debbra shares with audiences that are fresh, transformational, engaging, and deliver real world, practical, effective results for those who apply what they learn from her. Wow! I don’t know how you did it, but we’ve never had a company training create this much excitement, change and teamwork in such a short amount of time. In fact, I cannot recall ever seeing this type of results. Everyone is really excited for the new year of business, and they are all working together in a way we typically have not experienced. Your Shift Into Gear training really made a huge difference for us! Hi! 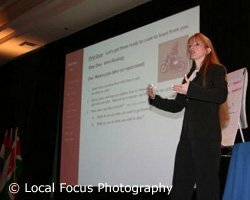 Could you please send me the power point materials for your fantastic Conference breakout “Shift into gear” for more referrals? It was fabulous and I look forward to presenting it to some of my chapters! Thanks for the great presentation on “Shifting into Gear” It will help us get for more referrals. Please send me your power point and flip chart presentations for us to present to all our AD’s. We want to take this on the road here in Las Vegas. Just attended breakout would love a copy. Brilliant stuff. I was at the breakout in San Diego and really found it valuable. Could someone please email me the power point you used? Thanks again for your great presentation you did in San Diego. I would love to implement this in my region in Germany and would appreciate if you could send me the presentation be e-mail. All the best and keep on steering your dirt bike with your rear wheel. Whether you are a business owner or a key employee, you are accountable the results your business has. Learn visionary ideas on how to align your team, get clarity on roles in the team, and unite in mind, efforts and execution for rapid results to achieve your business growth goals. Your business needs leaders with vision, goals and direction. Having a vision that includes your happiness, joy, and a sense of fulfillment as you walk the path for the future is highly rewarding. Sometimes though, we loose site of our vision. We let go of the things that make us happy, fulfilled, joyful. We might have once had big dreams but we set them aside too. What makes some people have great big, amazing dreams while others are content being a couch potato? If you have ever had a dream, a vision for your self or your company, but set it aside- are you ready to take action to make that dream a reality? Do you need direction to get you going to make things happen? Discover how to reach for the stars and get them with this interactive, inspirational, business focused presentation. Creating the Ultimate Customer Experience for Attracting, Converting & Retaining clients is easy. Behavioral based communication can create magic in your business! This presentation is fun, powerful and interactive. It helps you understand key insights on how you speak and enables you to adapt your communication style so that you are heard more clearly. Connect and create the WOW factor – by simply changing how and when you say things. Increase sales, improve marketing results, build deep, quality relationships with your customers who will remain more loyal to you, spend more money and refer more people. Customers today are highly educated and resourceful. They have money to spend and when they need your services or products you have only a few seconds to make a lasting impression. They are quick to decide whether or not you will deliver what they need. What is the culture, image, impression you deliver? Are you easy to work with and talk to? Is it an experience they will rave about? Or, is your company always filled with drama that creates a less than stellar experience? Are you creating value for your clients? Or do they feel like they have to help you do your job/business? Do you leave them feeling loved, appreciated, valued and respected- or do you leave them with a sour taste in their mouth? They don’t just by your products and service They buy YOU. Your essence, your company culture. They want an experience that makes working with you easy- and they want to know they made the right choice choosing you. When you learn these insider secrets and understand how to create the WOW by communicating with people in a way that THEY want to be communicated with, you can stand out in the crowd by delivering a magnetic, ultimate customer experience. Follow the advice in this seminar and you too can make your sales and marketing results go up in 30 days or less!